Nicole Claus, Cruise Shipping Director of the PORT OF KIEL said: “Actually it’s the very first time ever that we have registered 150 visits in a single season. The arrival today of the ‘Aurora’ is a milestone which underscores the development of Kiel into one of the leading cruise shipping ports in northern Europe”, she added. The port actually expects a total of 165 visits by cruise ships up to the end of this year’s season in October and has already passed its previous record of 147 visits recorded in 2016. 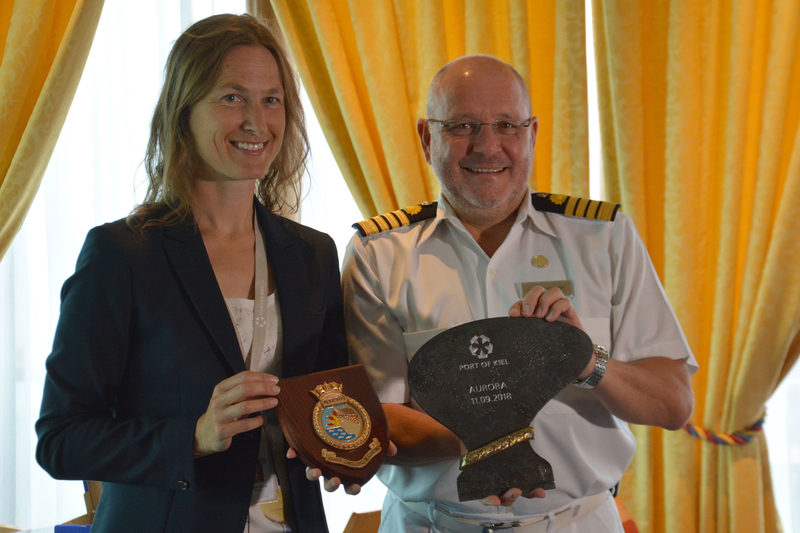 While the more than 1,800 English-speaking passengers on board “Aurora” were using the visit for a range of day excursions ashore, Nicole Claus was welcoming Captain David Pembridge at a reception on board and presenting him with the traditional commemorative plaque awarded by the Schleswig-Holstein federal state capital of Kiel to ships visiting the port for the first time. “Aurora” is the third P&O Cruises ship to visit Kiel and follows “Arcadia”, which called in 2016 and 2017, and “Adonia” in 2014. “Aurora” is on a 14-day cruise of Scandinavia and Russia, which began in Southampton on August 31st and has already taken the ship to Copenhagen, Helsinki, St Petersburg, Tallinn and Riga. During her stay in Kiel, “Aurora” is berthed at the Ostseekai Cruise Terminal. Because this facility is very close to the centre of Kiel, passengers have every opportunity to explore the state capital on their own, or to take part in a classic, organised excursion into Schleswig-Holstein itself. The possibilities include guided tours of the Kiel Fiord, visits to the historic Hanse city of Lübeck and themed excursions to the metropolis of Hamburg. Also on the programme are panoramic trips to the seaside spa resort of Laboe and to the scenic region known as Holstein Switzerland.